The end of last week saw a stock market drop which has many spooked. Pundits, financial pop -media, and others who make their living off of scaring investors have been using words like ‘market crash’, ‘historic drop’, and ‘recession’. In fact, I’ve personally seen a number of social media posts from friends discussing how they have gone 100% to cash after the recent market turmoil. Here are the 5 things you can do to keep the market downturn from ruining your financial plan. The number one thing you can do to avoid ruining your financial plan is to ignore all of this turmoil and keep on track with your existing plan. Market downturns happen, and an investor is going to experience up to a dozen market downturns over their entire investing life. If you are not nearing or in retirement, don’t react to a market downturn which will honestly have zero impact on your overall investing plan. And if you are in retirement, don’t react to a market downturn, the chance of which should have already been factored into your financial plan. No matter how grave the situation may seem, don’t fall into the temptation of reacting to short-term market movement by changing a well-thought-out financial plan. Instead, stick with the plan and ride out these seemingly important but ultimately inconsequential market drops. Even the 2008 credit crisis would have had no impact on an investor who stayed the course. 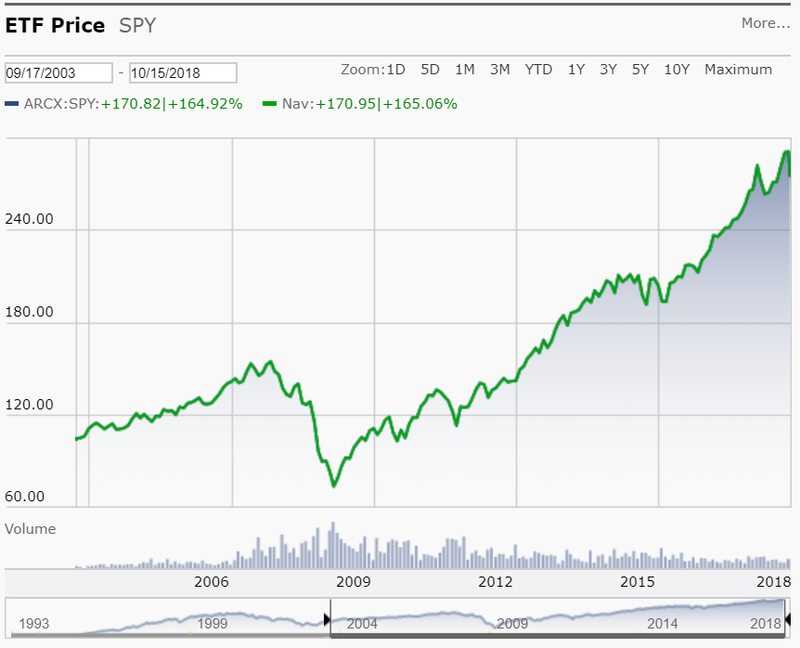 In 2009 the SPY S&P 500 stock index lost 1/2 it’s value from it’s high in 2006; dropping from around $174 to around $70. Those that did nothing were rewarded over the next decade with a 300% gain from the low in 2009. Those who are dialing back their investments in the stock market, or who are fully moving to cash, are practicing a method of investing called Market Timing. The idea is simple, you sell investments right before a market crash. The problem is, one would have to be incredibly arrogant or gullible to believe they (or anyone else) have accurate knowledge of the future. When looking at the math of market timing, the math overwhelmingly favors those who ignore the news and do nothing with their investments. William Sharpe, a Nobel prize winning economist and a distinguished Professor of Economics at Stanford, conducted research on comparing the mathematics of market timing verses simply staying in the S&P 500 and doing nothing. Sharpe found a market timing strategy had to be right 74% of the time in order to simply match the returns of an investor who did nothing. Meaning, unless you think you will accurately predict when the market will drop (in order to sell investments) and also accurately predict when the market will rise (in order to buy investments), then you will earn more money by doing nothing. Those who actually do try to predict the direction of the market are wrong more often than they are right. Essential Advisor Research studied experts in technical analysis and market timing (those talking heads you see interviewed on the news). What they found was the experts were correct only 47% of the time. Be very careful of where you get your information from and whose advice you take. The media does very little to vet sources for long-term accuracy, and often the more outlandish and bold the expert’s predictions are, the more the media flocks to them. Simply because outlandish and bold predictions help attract an audience. These experts are simply the P.T. Barnums of the modern era. Two of the experts often sought after and quoted by pop-media are Murrey Gunn and Peter Schiff. In fact, many of the posts from friends cited articles featuring these two men as the ‘economics experts’ who are predicting a market downturn. Both Gunn and Schiff are well-known known chicken littles who profit off of scaring people into buying Gunn's and Shiff's investment strategies to 'protect against market crashes.' In reality, their investment strategies actually do little more than make Murrey and Peter rich. On October 12, 2016 Gunn asserted “With the US stock market selling off aggressively on 11 October, we now issue a RED ALERT.” In the 2 years after that "RED ALERT" the S&P 500 went up 28% (14% return per year). Following Schiff would be just as bad, as he continually pushes the collapse of the economic system in order to make profit selling gold investments to the investing public. Schiff's amazing predictions include a 2012 prediction that Gold was going to rise to $5,000 by 2014. At the time gold was sitting around $1,700 an ounce. In reality, the price of gold crashed by 24% shortly after the prediction, and is currently down 30% since the prediction, sitting at $1,230 per ounce. Anyone who tells you they know what will happen in the market should be roundly ignored. And that includes me if I ever make such a stupid assertion. I'm not saying a market correction can't happen, but managing the risk of market corrections should be based on strategies rooted in academic research that create a consistent multi-decade plan. Not rooted in guesses of what will happen to the market over the next year or two. Last week’s market drop may seem like a huge deal, as SPY dropped from $288 to $274 in the matter of a couple days. The reality, however, is the last few days have not been crazy, or a plunge, or a crash. It's been a 5% drop. While the market could fall further, don’t think the recent drop guarantees anything in the future. To put the drop into perspective, the stock market drops by 10% on average once every year (357 days). And drops by 5% much more often than that. What this means is a 5% drop is not only normal, it’s incredibly mild considering the market usually drops by more than twice that amount once a year. In fact, the average market drop within a year is quite larger. According to Standard & Poor’s research, the average annual drop in the market (from peak to trough of a single year) is 14.2%. Putting last week into the perspective of what is 'normal’ based on history, a 5% drop is quite meaningless. Finally, stop managing your money as though your plan is to die soon. Ultimately, market timing is an exercise which assumes you don’t have time to outlast whatever financial storm might come. Your investing success is determined not by what happens in the next few years, but by what happens in the next few decades. Even retirees have multiple decades of retirement to plan for. The following two graphs will tell you everything you need to know about why the last week doesn’t matter to your final investing success. When looking at the stock market returns over the past month, the drop of last week looks downright scary. The problem, of course, is the chart offers no perspective of history. Instead of showing the history of the market, charts like this show a brief snippet in time. Often, showing a chart with such a short time frame is done to intentionally spin the truth into something else. For you personally, looking at a chart like this will give you a misleading view of what is happening. A view which then might lead you to make mistakes with your investments. If we pull our timeline out to look at the last 15 years, however, the recent drop doesn’t look so bad. In fact, many will be hard pressed to actually see the little drop at the end of the stock market chart. But it is there. Interestingly, this time perspective even includes the massive crash of 2008/2009. But from this perspective, that crash looks more like a blip than a catastrophe. Of course, if you decided to sell your investments in the stock market even before the market crash happened, you have lost out on a lot post-crash returns. Sadly, there are many who are still waiting for the right time to invest after the market crash of 2009. One of the worst things you can do as an investor is to assume the success of someone’s investing strategy (or your own) is due to their intelligence. Over the past decade, the stock market has increased massively with very little volatility. This consistent growth has led many active investors to think it is their amazing analysis of buying and selling at the right time which caused the increases in their portfolio. In reality, however, they likely lowered their potential return due to minor mistiming and increased fees. A researched-based investing strategy doesn’t involve timing one’s way into or out of the market. It involves setting a long-term asset allocation model that invests in broad asset classes with low correlations to each other. Not in guessing what the stock market (or any other asset class) might do tomorrow.